Asian Voice has been one of the most appreciated and accepted magazines in the United Kingdom. Buy a single copy or subscription to Asian Voice magazine. This magazine has been serving the British Asian community for over 35 years. It is the oldest and leading British publication. It is meant for the readers who are 20 years of age and above. With over 34000 subscribers and more than 5000 copies, It has been successful in reaching out to a wide base of readers who have enjoyed the magazine subscription and its content for so many years. Asian Voice is a magazine that targets the British Asian community. It has been receiving great response from among the Asians in Britain and others also. There are some key sectors that are especially associated with the magazine. This includes law firms, banks, and financial institutions. The magazine and its titles are promoted through community events and sometimes Asian festivals like Diwali and others! 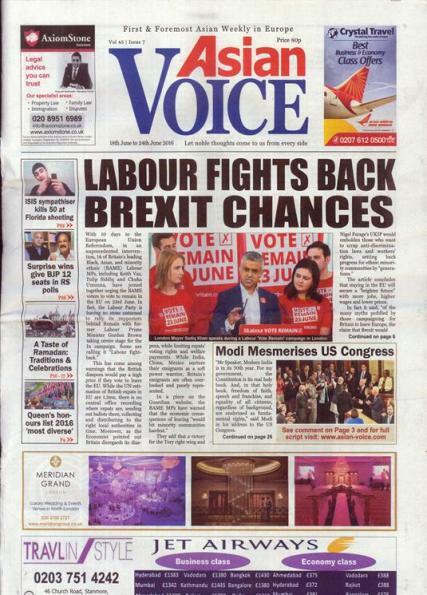 Asian Voice has managed to go from strength to strength over the years, bringing changes and improvements in its publication, starting from content, quality and circulation.